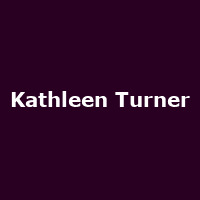 "Fane Productions present two-time Tony Award nominee and two-time Golden Globe Award winner Kathleen Turner in her debut cabaret, appropriately titled Finding My Voice. Lending her trademark husky alto to classic tunes from the American songbook, Kathleen interweaves songs including Let's Fall in Love, I'd Rather be Sailing, On the Street Where You Live, Every time we Say Goodbye and many more, with stories from her remarkable life and career. Over a long and varied career, Ms Turner has been awarded two Golden Globes, nominated for Best Actress twice for her work in Cat on a Hot Tin Roof and Who's Afraid of Virginia Woolf for which she also won the Evening Standard Award. She was nominated for an Oscar for Best Actress for her role in Peggy Sue Got Married. Her filmography includes such classics as Body Heat, Romancing the Stone, Jewel of the Nile and War of the Roses, as well as her star turn on TV in Friends. "